Fueled by her love of ancient and antique adornment, Paula Bixel established her Jewelry Boutique, Gilt, 23 years ago in Portland, Oregon in 1994. We have cultivated one of the largest selections of Vintage and Antique jewelry in the Northwest with an emphasis on Vintage and Estate Engagement Rings and Wedding Bands. If you prefer a more modern approach to jewelry, we also offer an in house line crafted locally by us using Recycled Metals and Gems, as well as a curated collection of unique and affordable Small Studio Designer Jewelry. We update our in store Jewelry Collection on a daily basis. We offer a wide price range to accommodate all budgets with many beautiful Vintage and Estate Engagement rings in stock at all times. We pride ourselves on having something for everyone. The Jewelry on our website represents a small portion of what is available in the shop. If there is something you are looking for that you don't see here please call or email us and we will be happy to go thru our entire inventory for you. 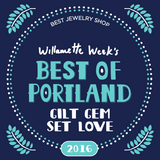 Gem Set Love is the place to shop for Fabulous Jewelry. If you're in Portland we would love to meet you, so drop in to say hi and see our extensive and diverse collection, and try things on. Carley, Lori, Kate, Georgia, and Paula will all be glad to help you. As the shop Evolved over the years the curated collection of Antique and Vintage Jewelry became more Focused and Refined. Paula began designing and crafting an in house line of Jewelry using recycled metals and Gems. She felt the need for a name that better reflected where the shop is at now. 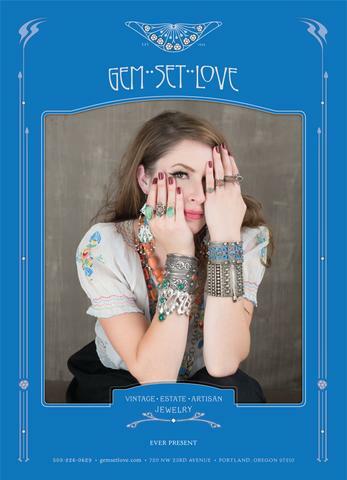 A name that expressed her Love and Passion for the treasures she feels lucky enough to work with; Gem Set Love. Paula looks forward to another 23 years (at least!) of obsessing over Jewels in her circa 1903 Storefront in NW Portland Oregon. 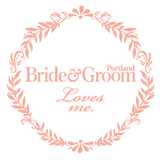 Gem Set Love is the same Shop you have known and loved since 1994, still owned & Curated by Paula. It's still us behind the counter and we still do what we love, geeking out on Jewels, and helping you find just the right thing. We've also added an in house metal smith who specializes in Vintage and Antique pieces so now it's easier than ever to have your rings sized or your heirlooms restored. We also now offer hand engraving of your jewels. Our Jewels always ship in our elegant signature packaging. We are excited to have our own in house Metalsmith. The top floor of our shop is now dedicated to our metalsmithing studio. We now offer in house restoration of your heirloom pieces and Custom designs. All of our Gold and Platinum rings come with one free sizing. We are happy to resize, re-tip, re-shank, and repair Jewelry for you, whether a vintage piece or new, we can help. We have a laser welder for those delicate jobs that require special treatment. Our metal smith is specially trained in Vintage and Antique Repairs and Restoration, and our sales staff is trained in aiding you in what needs to be done to keep your heirloom wearable for years to come. Whether you need a stone replacement, a chain repaired, a ring sized, an extensive restoration or a uniquely beautiful custom design we are here to help.